Dean Kamen is an American businessman and inventor. Kamen is best known for the invention of the electric-powered Segway personal human transporter, best described as a stand-up scooter (see photo). The Segway was much publicized before its initial unveiling to the public with conspiracy level intrigue as an invention that was going to change the world. Nothing was known about it except its original name of Ginger and that Dean Kamen was the inventor, however, the speculation about Ginger had folks thinking it might even have been a revolutionary type of free energy device. 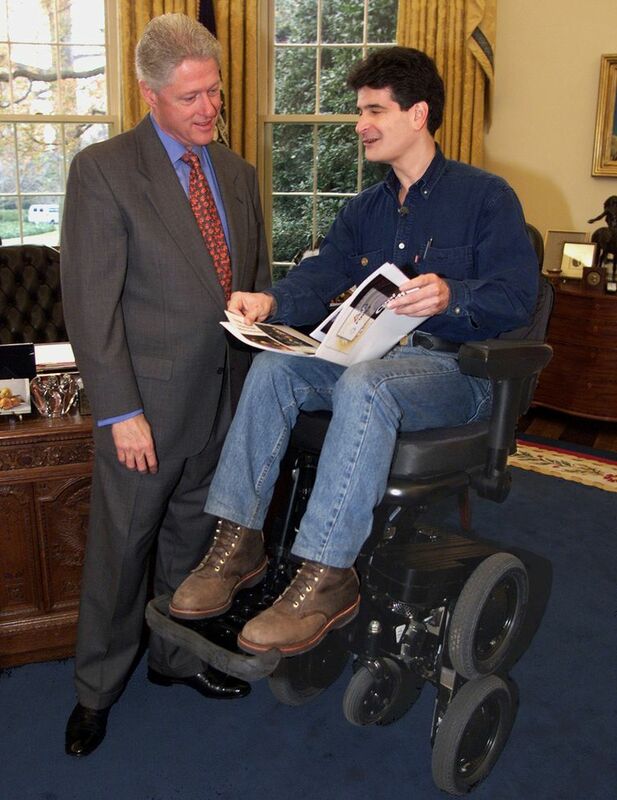 Other than the Segway, Dean Kamen has had an interesting career as an inventor and together with his company Deka has produced several inventions in the fields of medicine and engine design. Below is a partial listing of his accomplishments, Kamen holds 440 U.S. and foreign patents. Dean Kamen was born April 5, 1951, in Rockville Center, Long Island, New York. His father, Jack Kamen was a comic book illustrator for Mad Magazine, Weird Science, and other EC Comics publications. Evelyn Kamen was a school teacher. Biographers have compared Dean Kamen's early years to those of Thomas Edison's. Both inventors did not do well in public school, both had teachers that thought they were dull and would not amount to much. However, the real truth is that both men were too smart and bored by their early educations, and both were avid readers who constantly educated themselves about what interested them. Dean Kamen was always an inventor, he tells a story about his first invention at the age of five, a device that helped him make his bed in the morning. By the time he reached high school Kamen was making money from his inventions which he built in the basement of his home and was designing and installing light and sound systems. Kamen was even hired to set up a system to automate the fall of the Times Square New Years Eve ball. By the time Kamen graduated from high school, he was making a living as an inventor and made more money per year than the combined income of his parents. Kamen attended Worcester Polytechnic Institute but dropped out before graduating to founded his first company, called AutoSyringe, to sell his medical invention (a drug infusion pump) that he invented during college. Dean Kamen eventually sold AutoSyringe to another health company, Baxter International, in 1982, in a deal that made Kamen a multimillionaire. Kamen used the profits from the sale of AutoSyringe, to found a new company, DEKA Research & Development, named after the inventor " DEan KAmen". In 1989, Dean Kamen founded his non-profit called FIRST (For Inspiration and Recognition of Science and Technology) designed to expose high schools to the marvels of science and technology. FIRST holds an annual robotic competition for high school teams. "You have teenagers thinking they're going to make millions as NBA stars when that's not realistic for even 1 percent of them. Becoming a scientist or engineer is." "There is just so much stuff in the world that, to me, is devoid of any real substance, value, and content that I just try to make sure that I am working on things that matter." Dean Kamen's profile on TED includes three videos: Dean Kamen on inventing and giving, Dean Kamen previews a new prosthetic arm, and Dean Kamen: The emotion behind invention. Dean Kamen demonstrates his prosthetic arm on the Steve Colbert Show.